Despite the fact that we haven't heard much about the Zika virus in recent years, it remains a potential danger to travelers planning to visit places where the virus remains active. This is especially true for pregnant women or couples who are considering getting pregnant in the near future. So even though the number of Zika cases has dropped off substantially in recent years, it is still a good idea to take measure to try to avoid contracting the virus. To help with that process we've compiled a list of products designed to keep biting insects, such as mosquitoes and flies, at bay. This not only lowers the likelihood that you could come in contact with Zika, but other diseases carried by insects as well. Here are some items you may want to take with you the next time you set out on your travels. Craghoppers is well known for making high-quality travel apparel specifically with adventure travelers in mind. The company has an entire collection of apparel that has been made using a product called Insect Shield, which applies a special coating that has been proven to repel bugs, including mosquitoes. Additionally, the company has also partnered with National Geographic to release a line of gear that is made to be worn on wild adventures. One example of this is the Adventure II long-sleeved shirt. This classic looking piece of apparel looks just as comfortable on safari as it does trekking around town. Its fabrics include both moisture and odor control properties, and it offers a UPF 40+ rating for protection from the sun too. To top it off, it includes five pockets for storing important items as well. One of the great things about apparel from Craghoppers is that they are highly technical in terms of performance, but they still manage to look stylish in both urban and wild settings. The Cargo II pants fit that description nicely, and since they are also part of the Insect Shield collection, they also provide protection against insect bites and UV light too. Lightweight and highly packable, this is another article of clothing you'll want with you on your personal adventures. Cooler weather doesn't always keep the mosquitoes from biting, which is why its nice to have a warmer jacket to pull on in those conditions. The Tilpa Hooded Jacket provides an extra layer for those cooler nights, but it is also coated with Insect Shield to prevent mosquitos, as well as ticks, flies, and fleas, from biting. True to the Insect Shield label, this is a zipped hoody that is surprisingly lightweight, good looking, and is versatile too. It also happens to be warmer than you would expect based on the thickness of the fabrics, which makes it handy for a wide variety of destinations. This is the perfect option for those evenings when the weather is a bit cooler than expected, but not truly cold. Wearing insect repellant clothing isn't the only way to keep mosquitoes from biting. 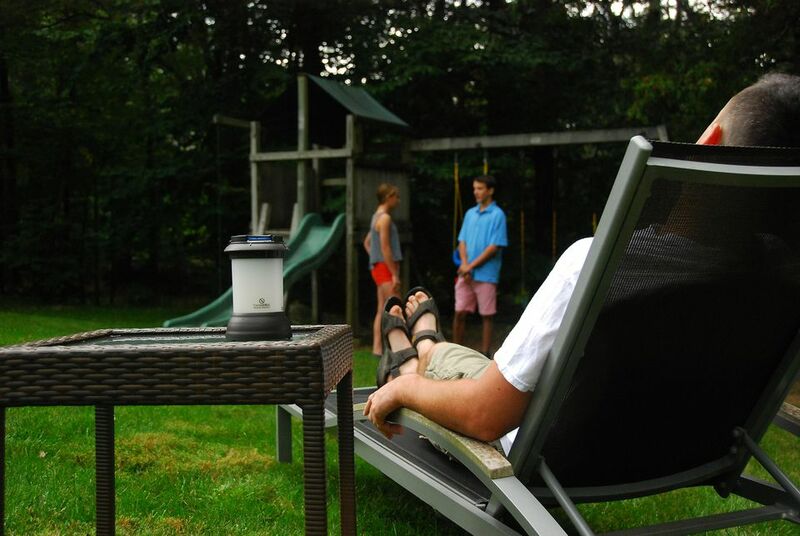 Thermacell has created a line of products that uses a special process to create a barrier around your campsite, patio, or other outdoor settings. The company even offers wearable devices that you can take on your travels as well. One of the most effective and portable versions of the Thermacell technology is the company's Radius Zone device. The tiny device is powered by a rechargeable battery and can run for up to 6.5 hours at a time. During that period, it will create a bug-free zone in a 15-foot radius in all directions, allowing travelers and campers to avoid insects without using chemicals or lotions. It is also TSA-friendly and compact enough to take with you wherever you go. The N'visible insect repellant patches use a different approach for preventing mosquitoes from biting. You simply apply one of these patches to your skin, and the vitamin B-1 Thiamin that it is infused with will be taken into your body and then secreted out as an unmetabolized gas. This has the effect of overloading a mosquito's sense of smell, causing them to be unable to find their prey. This is a safe and natural way to prevent the insects from biting and thus helps the wearer to avoid exposure to Zika in the process. A $10 pack of N'visible includes 30 patches. These are just a few examples of products that can be used to avoid bug bites that could potentially be carrying Zika or other diseases. As always, be sure you are properly equipped and taking the appropriate measures when visiting destinations where these ailments are common.